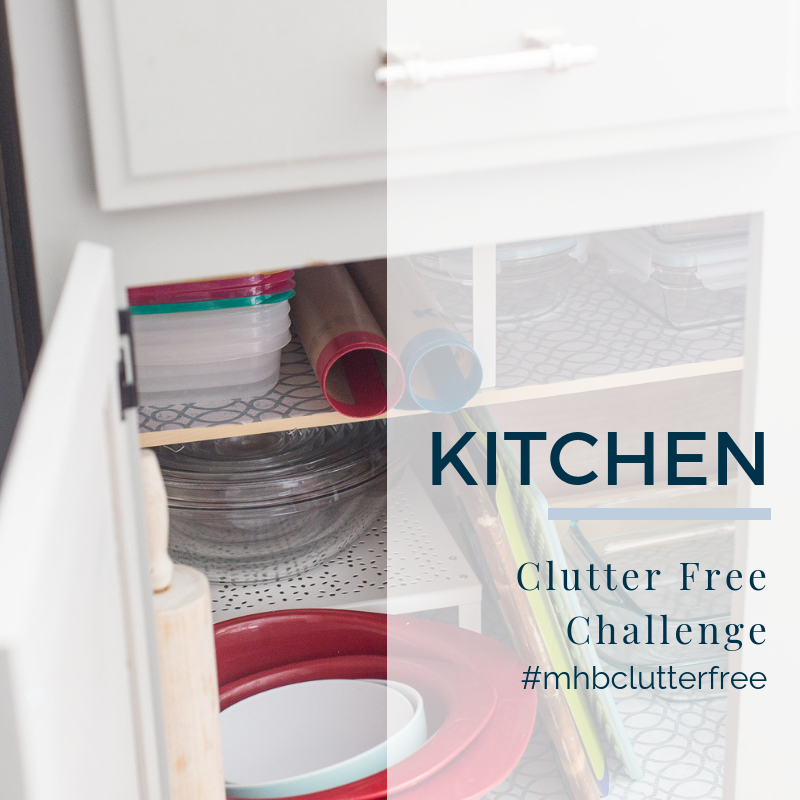 Happy Clutter Free Challenge, friends! I’m so pumped about this challenge and cannot wait to see how we all get ourselves organized over the next six weeks. 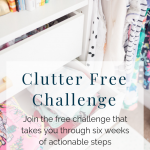 If you’re just popping in, it’s not too late to join our Clutter Free Challenge. 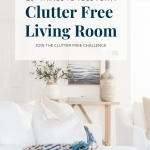 As I mentioned in the outline of the challenge, this is a plan, it’s completely customizable to your families needs, I want all of us to walk away feeling successful. Week one is all about Kitchen Organization. Last year around this time I completely organized my kitchen cabinets and drawers. Those are mostly still in order but could use a good purge. I think the best place to start is by getting rid of all the baggage so to speak. 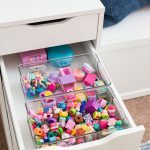 By getting rid of the unused and nonfunctional items frees up the extra space we need to organize. Go through every inch of your kitchen and figure out what you can pass on. 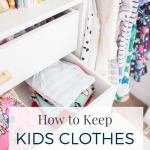 Create a pile for items to donate and a pile for items to toss. 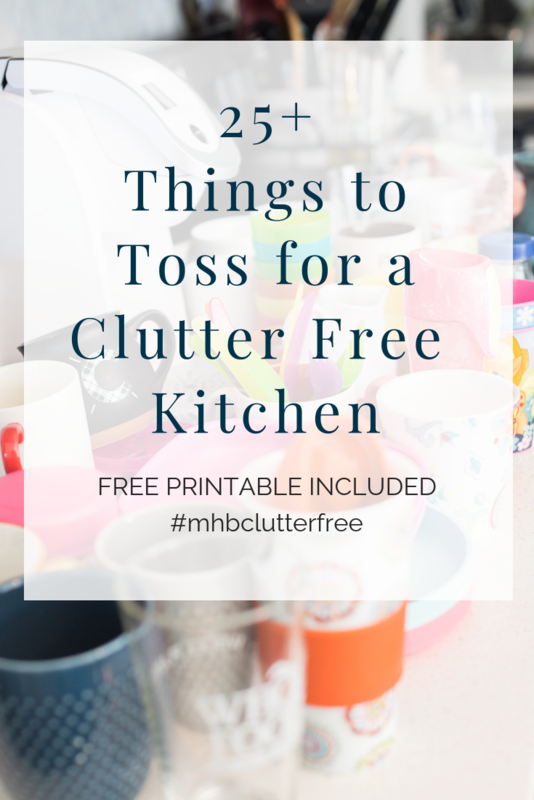 If you need a jump start on what to get rid of, I created a handy list of things you can get rid of right now to declutter your kitchen and create more space for kitchen organization. My new rule is that if it hasn’t been used in 1 year or more, we don’t need it. That means, I get to keep those items that I only use for special occasions but I don’t keep things I’ve been hanging on to for no legitimate reason. Dish Towels | How many do you really need? I never realize how much of a dish towel hoarder I was. Survey your towels and toss the ones that have been reduced to rags. I ended up banishing the majority of mine to the garage for Matt to use in his workshop. Worn Sponges | If you’ve got more than one sponge in your kitchen, ditch the extras. Cleaning Supplies | My new rule is that if it hasn’t been used in 1 year or more, we don’t need it. This goes for everything in our home including cleaning supplies. Paper/Plastic Products | We had some plastic cutlery that had been in our pantry since we moved in (3 years ago), it was time to ditch it. If circumstances arise that I need plastic cutlery again, I feel okay spending the $1 to re-purchase. This goes freezer paper, parchment, wax paper, etc. as well. I had one of each but really only use parchment – the rest went to the donate pile. Cooking Utensils | Is it functional? Do you use it? Do you have more than one? If it’s functional and used regularly keep it unless it’s a multiple. I decided to keep two of some items (spatulas, wooden spoons, tongs) and made sure to just keep one of everything else. Baking Supplies | Ditch unused sprinkles, food coloring, baking cups, birthday candles, etc. Baking Pans/ Cookware/Mixing Bowls | Is it functional? Do you use it? Do you have more than one? These take up tons of cabinet space so if you can pare down, do it. How many baking sheets do you need? Cake pans? Does that pot have a lid? When was the last time you used that wok? Food Storage Containers | Last year I got rid of most of my plastic food storage and swapped for glass. This worked out well for me and since I’ve gotten rid of the right of my plastic food storage. I think I prefer glass because it’s easier to keep track of the lids. Not one has gone missing. Get rid of containers without lids, lids without containers, multiples, cracked or broken pieces. Spices | Toss expired or unused spices and consolidate any duplicates if possible. Canned Goods/ Misc Pantry Items | This was the biggest purge for us. Ditching expired canned goods, items that we know nobody will eat, snacks the girls loved but don’t anymore, and any almost empty containers. Cutlery | Pare down your cutlery if needed. Coffee mugs/glassware/ dishware | Toss any mismatched dishes or glasses, ones that are unused or typically banished to the back of the cabinet. Clear out your coffee mug collection letting go of ones that aren’t favorited by members of your family. Also, clear out kids dinnerware tossing extra lids without matching cups, etc. Small Kitchen Appliances | If it hasn’t been used in 1 year, donate it. 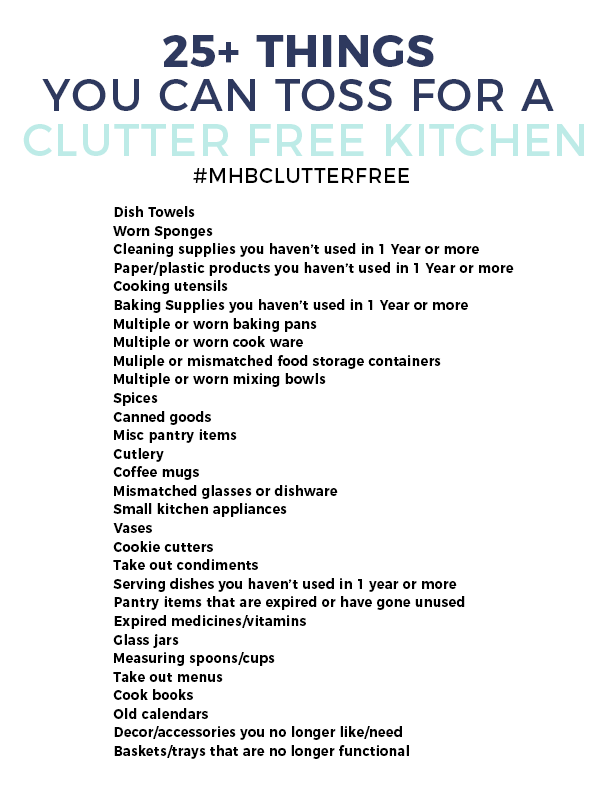 See below for a more extensive list of things you can declutter before beginning your kitchen organization adventure. 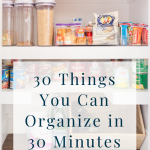 Later this week I’ll share how I’m tackling my pantry (AGAIN) and why I think this time it will stick.